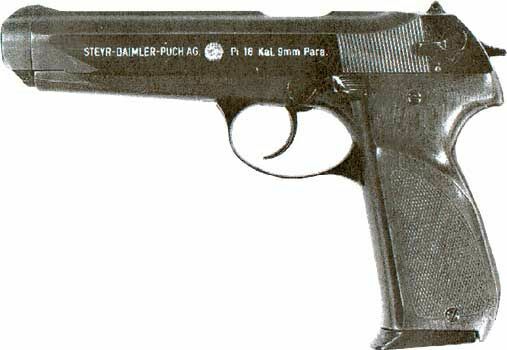 STEYR Pi-18 (military trial version) and STEYR GB (later improved version for civilian market) Type: Double Action semiautomatic handgun Chamber: 9x19mm-Parabellum / 9x21mm-IMI Weight: 845 grs. empty / 1285 grs. loaed Length: 216 mm Barrel length: 136 mm Capacity: 18 rounds The development of the GB pistol was started by Steyr-Daimler-Puch AG (now Steyr-Mannliher AG), Austria, in the early 1970s, when the Austrian army announced its plans to replace aging P38s and High Powers with the new pistol. Original design, labelled as PI-18, was developed in 1974, and final version, called GB, entered production in 1981. The production of the GB was ceased circa 1988, after some 15.000 to 20.000 pistols had been produced. The GB is a blowback-operated, gas-retarded blowback semi auto pistol. It uses some of the hot powder gases, feed from the barrel into the front part of the slide, to slow down the retraction of the slide before the bullet leave the barrel. This scheme was developed by German engineer Barnitzke at the end of the WW2. The gas brake is formed by the barrel, its bushing and the slide. The trigger of the GB is of double action design, with the slide mounted decocker lever. GB also featured firing pin block that unlocks the firing pin only when the trigger is completely depressed. The frame and the slide is made from carbon steel with special high-strenght finish. Barrel has polygonal rifling and is chrome lined, and solidly attached to the frame. The sights are fixed and featured white-dot inserts (one in the front sight blade and two - around the rear sights notch). Some early GBs were manufactured with steel grip panels, with all the rest manufactured with plastic checkered grips. Thanks to its gas-retarded blowback design and solid weight, that resulted in low felt recoil, and to the barrel with polygonal rifling, that toesn't move when firing, the Steyr GB displayed wery good accuracy. The reliability is also adequate, at least. 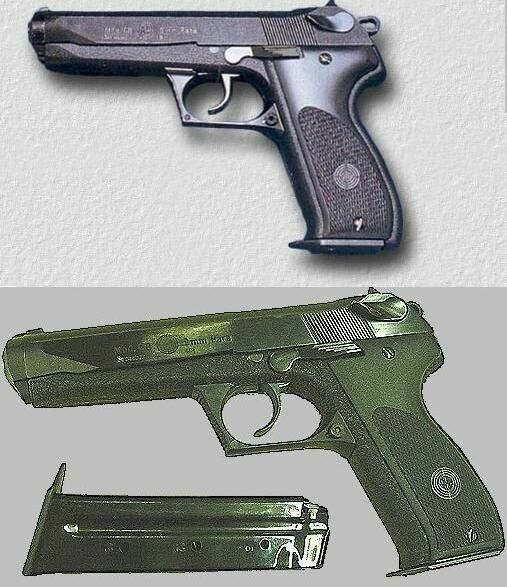 While the GB failed at the Austrian and USA Army pistol trials (won respectively by Glock 17 and Beretta 92FS-B), it was used by some Law Enforcement and Special Operations forces, and also was sold to civilians in Europe and USA.